Due to exhaustible resources, large urban developments, and the current attention given to climate issues, sustainable building is back on the agenda. This goes for governments in both well-developed countries like France, Spain, the US, and the UK, as well as in fast developing countries, like China, the Eastern European countries, Middle-Eastern, Latin-American, and South-Asian countries. Sustainable Housing Projects takes a wide, conceptual approach for sustainably-built projects, which allows an integrated approach to the various stakes and stakeholders. Such an approach is particularly suitable for a medium scale level, involving neighbourhood development, and a number of examples on this scale level are included. 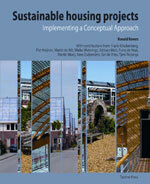 This book presents knowledge gained over the last 15 years developing new sustainable housing projects in the Netherlands. It is written by a team of specialists in sustainable building, both practitioners and researchers, and is meant for colleagues world-wide, who want to implement a sustainable building project. The compact, practical tone, the many colour illustrations, tables and boxes, make the book an accessible and practical read.